1906 was the beginning of Brunei's modern administration brought about the first British Resident, Mr. MSH McArthur. With the modern administration, many old institutions were broken up. One national institution was the administration of land ownership. Up to 1906, land belonged under one of the three types of administration, the kuripan, kerajaan and tulin. You either had to be one of the descendants of these holders or you are not. Or if you are rich enough, you can own the beneficial rights by paying the holders lots of money. Anyway, come the modern government in 1906. The first thing they did was to establish state lands which could be leased out or given out to companies who can make economic use out of it so that the country can benefit. The 1909 Land Code did that. Last year was the 100th anniversary of the modern land administration. The Land Department did a 100 year celebration by holding a national land seminar but unfortunately the stamps to commemorate it were not ready. The stamps came in three values 10c, 20c and $1. 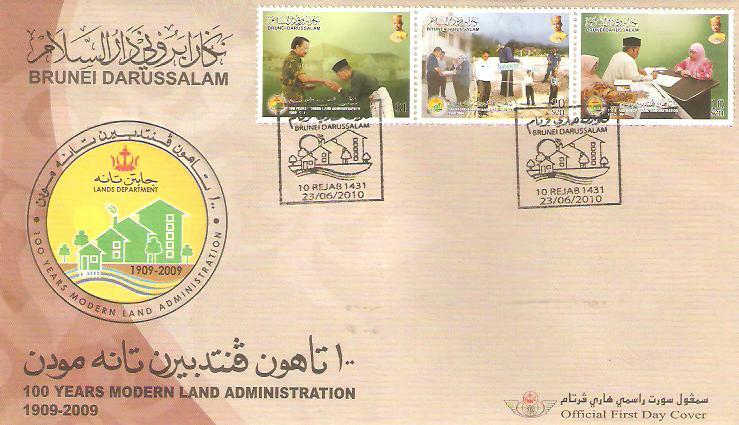 The 10c and 20c depicted, employees at the Land Department doing internal and external work and the one on the $1 stamp was a lucky recipient receiving land title given out under the Skim Penggeranan Tanah TOL. On 22nd September 1989, the United Nations issued this first day cover. I am not sure whether the UN only issued one first day cover for Brunei only on this day or whether the UN issued many other first day cover on the same day - all based on the nations' flags. 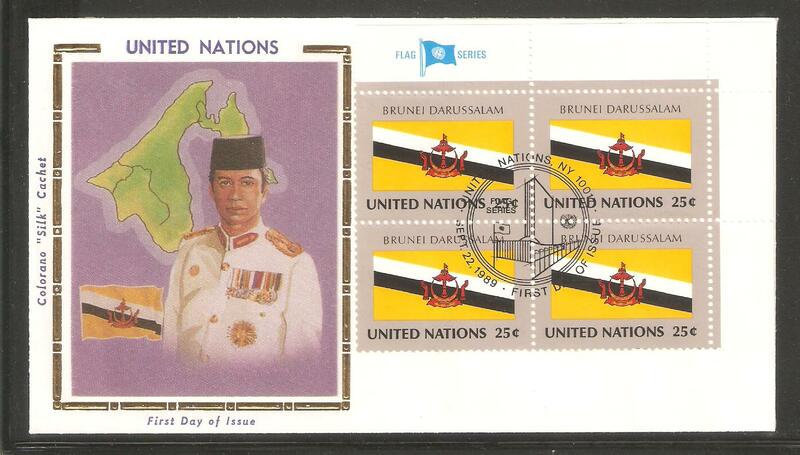 This flag design is surprisingly the only flag design that any stamp, Brunei or otherwise has depicted. 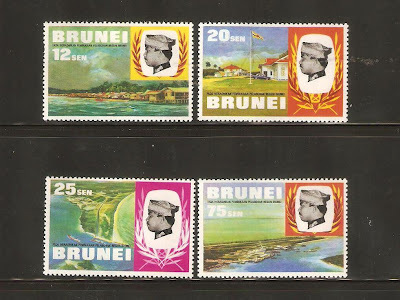 Not a single stamp issued by Brunei has the country's flag as its theme. That must be an oversight of sorts. The first day cover also depicted the shape of the country and a picture of a person. Those actually are on a piece of silk attached to the front of the cover. The map of Brunei is clearly wrong - there is a land attachment between the four districts. Whoever it was that was assigned to do the map could not have believed that there is such a country completely cut off from its fourth part. So he decided to do a land attachment which was so nice of him and I am wondering since this is on an official United Nations first day cover, whether this could be used as a basis for you know what. The second interesting thing is - who is that person? If it is meant to represent His Majesty, the artist was a very unskilled one. If it is meant to represent the then Brunei's Permanent UN Representative, I cannot recall who he was. Maybe someone can help me. These 4 stamps were produced to commemorate Muara Port's Official Opening in 1970. On the stamps it is stated 'Pada Meresmikan Pembukaan Pelabohan Negeri Brunei'. I don't know what actually happened why the stamps were not issued. The Muara Port was officially opened by Her Majesty Queen Elizabeth II when she officially visited Brunei then. But the stamps did not depict her opening the Port. Probably that is one reason why the stamps were not issued. I am only guessing. I really can't see anything wrong with the designs of the stamps for the stamps not to be issued. There are 4 values, 12c, 20c, 25c and 75c. The 12c stamp shows the Kampong Ayer or probably try to depict some of the houses in Muara then. I don't recall there were that many houses on water then. 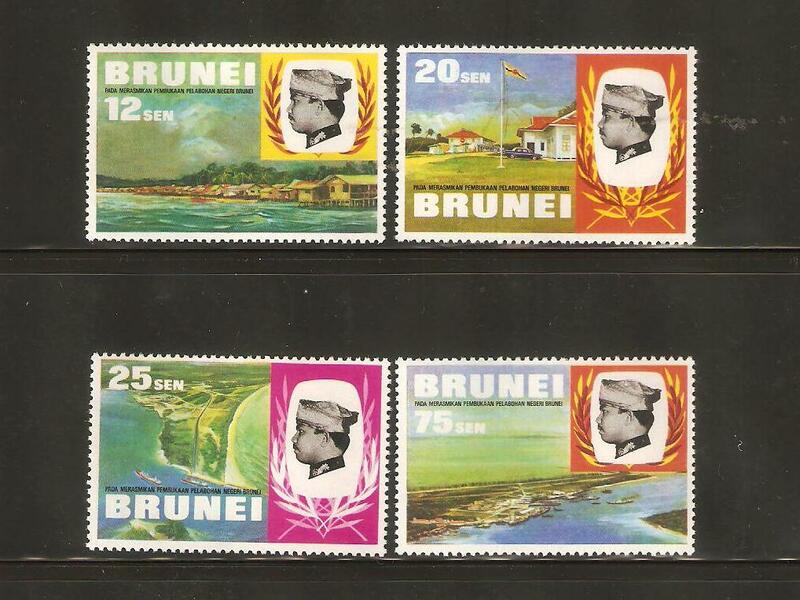 The 20c stamp shows what Muara Town used to look like standing from the Port looking inland. The 25c showed the cut split where the tanjung was cut to allow in ships to pass through. Finally the 75c showed what the Port facilities look like from the air. I asked him how he managed to acquire these 4 stamps. As usual, someone brought them in for him to buy. I asked him how much. He left the price to me. This was most difficult. I have never seen these stamps in real life. Forget the catalogues, it does not matter which catalogue you refer to, there is no price. I don't know how many pieces are out there, so I can judge the supply level. I don't even know anybody who had these stamps. So I showed my hand. He looked at the hand and told me that he expected the stamps to be worth at least that much, he said he will make money but he said that the stamps may be worth much more. I thought about it and add three more fingers, I was going to show 2 1/2 fingers but I don't know how to do that in finger signs. He accepted the price. I was just happy and overjoyed to have acquire a set of stamps of which I don't know whether I will ever see again. Greetings! It has been ages since I last updated this blogsite even though my main one is updated frequently. The main reasons were that there have been too many sad passings, my uncle, my aunty, my mother-in-law and a few others in the space of a short few weeks. I thought I will take a break. However when I wanted to start again, guess what? I can't remember the password to this blogsite. It took me quite a few attempts before being able to get in. But here I am. Over the last few months, I have traveled a fair bit too. Let me see. I have been to Bangkok, London and Rio de Janeiro with stopovers in Dubai, Paris and Singapore. It has been that hectic. I have managed to acquire lots of currency notes during my travels but most importantly I have managed to acquire quite a good collection of postcards as well from ebay. It has been that busy! Let me start with the Brazilian Reais. I have never actualy seen what the Brazilian currency look like until I exchanged British Pounds for Reais in London. That's when I began seeing it. 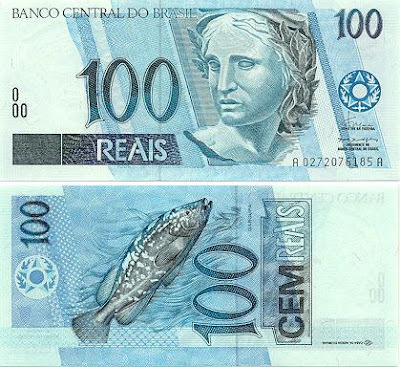 The 100 Reais notes is the highest value note of the current Brazilian series. The others are 2 Reais, 5 Reais, 10 Reais, 20 Reais and 50 Reais. There used to be a 1 Real note but that has gone the dodo, so you only get 1 reais round coin. I tried searching for an antique dealer. Dealers are easier to deal with. Unfortunately I could not find one in Rio. But our driver managed to acquire some old notes and sell them to me. I tried buying the rest on ebay and found that it is almost a daunting task. Brazilian currencies depreciate so fast that they keep coming up with new currenies. I will share the other stuffs sometimes in the future.